Grout Free Surfaces – No More Painful Scrubbing! 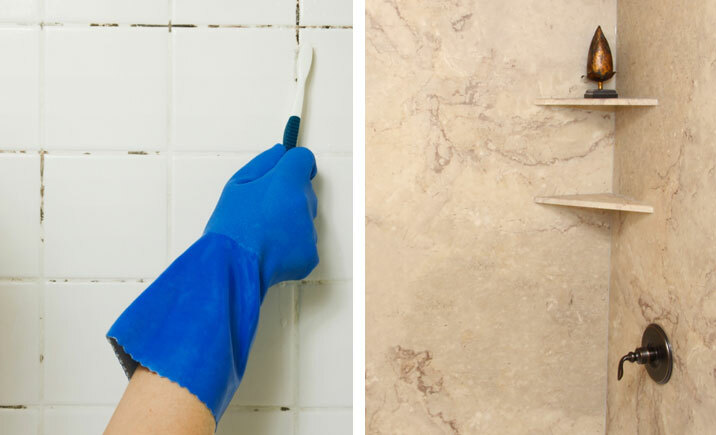 Are you tired of cleaning that nasty tile grout? If you’ve ever had tile on your shower walls or floor, you know what a struggle it is to keep the grout lines clean of black and moldy spots. 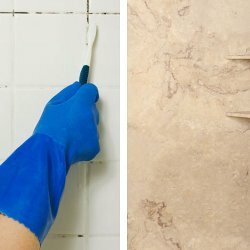 Not only is tile grout difficult to keep clean, but water can get behind the tile and cause mildew and water damage resulting in thousands of dollars of repairs. Tile is definitely not the most practical surface for your shower walls or floor. You don’t have to sacrifice style and design to have a cleanable and practical bathroom surface. With Tyvarian® surfaces, you can have a grout-free shower wall, bathtub deck, shower floor and vanity top that is as easy to clean as traditional cultured marble and provides an array of colors and designs to satisfy your style appetite (see our available colors here). Tyvarian® surfaces won’t ever require sealing and are impervious to water, mold and mildew. 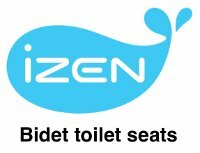 With your beautiful and easy to clean bathroom you can now spend less time cleaning and more time relaxing.